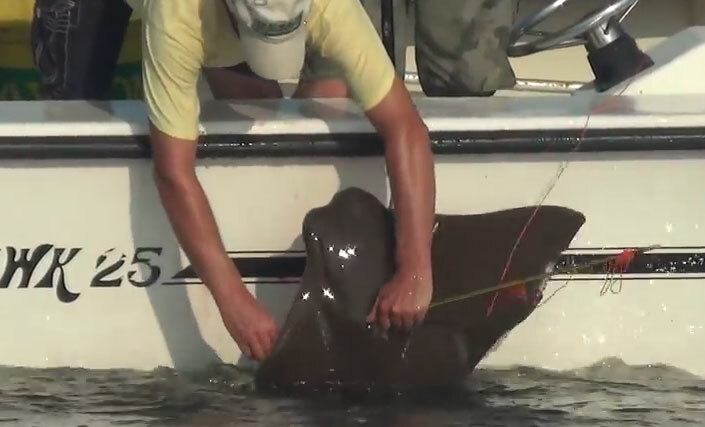 WASHINGTON — Two animal protection groups are asking Maryland’s governor to prevent future competitions in which bowfishers hunt cownose rays. Dozens took part in the first Patuxent River Battle of the Rays on June 13 in Mechanicsville, Maryland, on the tributary of the Chesapeake Bay. The animal protection groups – SHARK (Showing Animals Respect and Kindness) and Fish Feel – on Monday released undercover video showing pregnant rays during the competition weigh-in process. Chaifetz doesn’t want there to be a second Battle. The cownose ray is a brown, kite-shaped ray with a long, whip-like tail that visits the Cheapeake Bay’s shallow waters in summer, according to the Chesapeake Bay Program. Participants in the event were required to present valid Maryland fishing licenses. Event organizers were not immediately available for comment.